Widely distributed in the Pacific and Atlantic Oceans. Two common genera; Favia, Montastrea. Genus Australogyra (Veron and Pichon 1977). One species. Australogyra zelli (Veron and Pichon 1977). Branching colonies of up to two meters across. 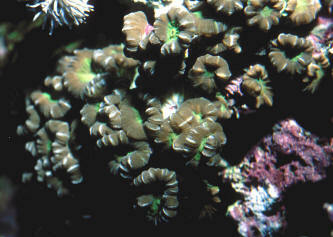 Corallites of thick walls that are smooth and rounded. Bunaken, Sulawesi, Indonesia image. Genus Caulastrea Dana 1846, Candy Cane Corals. From the Greek: "Kaulos" meaning Cabbage stalk and "Aster" for star. Look like a sprouting cabbage on their stick like ("phaceloid") colonial structure. Caulastrea echinulata (Milne Edwards and Haime 1849). Though septa are exsert, they're all about the same size. 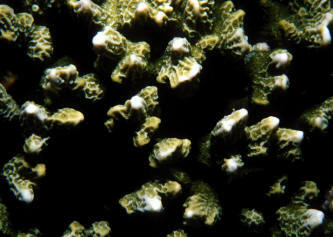 Small polyps, fleshy. Aquarium photo. 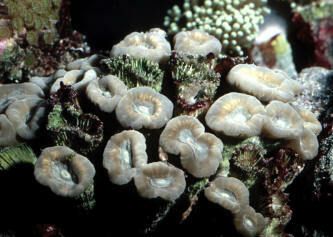 Caulastrea furcata Dana 1846. 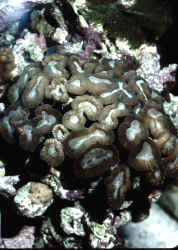 Small corallites (under 10 mm. in diameter). Septa are irregular, some much larger (tooth-like) than others, sticking out. Have distinctive "candy cane" appearance. Common in the wild and captivity. Easily kept, cultured, reproduced by fragmentation. Aquarium pix. Genus Colpophyllia Milne Edwards and Haime 1848. One species. Colpophyllia natans (Houttuyn 1772), Symmetrical Brain Coral. 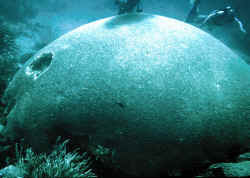 Large roundish to hemispherical colonies or encrusting. Long snake-like valleys. Septa short, equal and pointing out. A fine ambulacral groove runs along the top between corallite walls, and a further line can be seen midway down the valleys where they change slope to the bottom. The world's largest Brain Coral on the right off of Flying Reef, Tobago; below, a view of it edge-wise and a colorful shot and close-up of smaller specimens in the Bahamas.